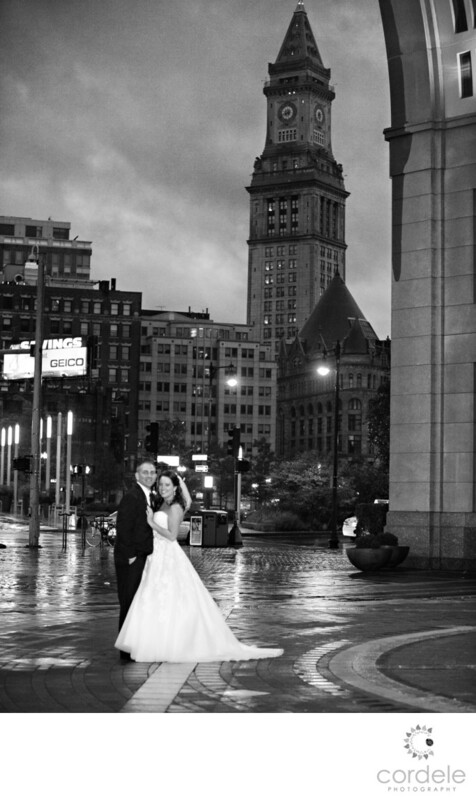 A rainy day portrait of a bride and groom under the arch of the Boston harbor hotel with the custom house tower behind them, is a favorite! There is nothing worse than getting married and then realizing it's going to pour rain all day. I always tell my clients, it's all in what you bring to the photos. If you are bummed out you are not going to get great photos but if you get excited, we get excited and we work even harder, despite the rain. Our cameras are waterproof and water sealed so we can get wet. Yes, it was cold, and Yes it was raining but the photos we took at Jessica's wedding were amazing. Every photo we captured Boston or their love or both. I had such a great time running around North Square with them getting different angles in the pouring rain. They weren't worried about getting the dress dirty or about being cold. They trusted us to do an amazing job, and we did. I love this photo because it shows the reality of the day without taking away the fact that these two got married! They were so in love with each other it was so great to be part of such a wonderful event. Her mom was so sweet and helpful. I was 8 months pregnant with my third baby and they were so understanding when I had to go a little slower! We shot this under the Boston Harbor Hotel arch, and normally you get kicked out. They reserve that for couples only married there. This night, they took pity on us because it was so cold and rainy!